Well into the twentieth century, the open level land in the Elwood-East Northport area was used for farming. The post-World War II population boom on Long Island saw these farms sprout houses instead of crops. Few remnants of the area’s earlier history remain. There are a couple of historic houses on Elwood Road, but little else. Tucked away in a 1963 subdivision bordered on the west by Elwood Road and on the south by Cedar Road is an unexpected historic site—a cemetery. It was not unusual for local families to set aside a patch of ground as a place of burial for one family or for several. In fact, throughout the Town of Huntington, there are 56 such historic cemeteries. Most are very small—one has only one grave. Many are landlocked in someone’s backyard. The cemetery on Foothill Lane sits on a half acre plot with full access from the street, just like the houses in the neighborhood. It is almost as if the builder forgot to build a house on one of the lots. On this half acre parcel are five intact gravestones, five broken stones, and one fieldstone marker. The five intact stones mark the graves of seven members of the Totten family who died between 1902 and 1946. There is no indication of who the Tottens were; but it is reasonable to assume knowing the history of the area that they must have been local farmers in the days before suburbanization. However, the atlases of 1909, 1917, and 1931 do not show the name Totten on any of the nearby properties. Further research reveals that these Tottens were not local farmers—they weren’t farmers at all. They lived in Brooklyn, but they had deep roots in Elwood. When they died, their families brought the bodies back to be buried with their ancestors. Now that the dates are earlier, it makes sense to consult earlier maps. The name Totten does not appear in this area on the 1858 or 1873 atlas. But the 1837 Coastal Survey shows a Totten house on the north side of Cedar Road near where Greenvale Drive is today—about 640 feet southeast from the cemetery. Census records and newspaper articles provide clues to the family. The 1790 census lists a Nathaniel Totten as a head of household living with a woman over the age of 16, presumably his wife. The early census takers did not gather much information about those they were recording. But from this meager record, we know that the Totten family had a long history in Huntington. The Ruth Totten listed above, who died in 1809 at the age of 47, was probably Nathaniel’s wife, assuming the Nathaniel on the census is the same as the Nathan on Ruth’s grave stone. Nathan(iel) and Ruth seem to have had at least two sons Nathan born circa 1793 and Peter born circa 1800. In 1850, Nathaniel Totten, Jr. (there’s that inconsistency in the names again) and his wife Lavina defaulted on a mortgage. [i] Two farms, one 10 acres, the other 12 acres, were to be sold at public auction. The 10 acre farm was located on “the highway leading from the Dwelling House of said Nathan Totten, Jr. [the name changed from one line to the next within the printed notice] to the house of Isaac Buffett.” That would be Cedar Road. 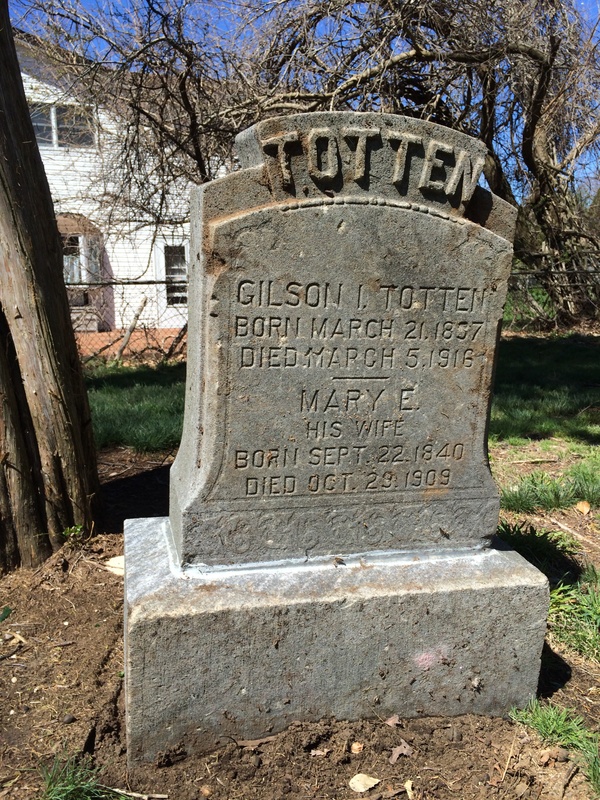 A third Nathan Totten died in 1851 at the age of 33. He may have been the son of the Nathan Totten who defaulted on the mortgage. This third Nathan was deaf and mute. His wedding in 1844 to Mary Emma Mitchell, also deaf and mute, received notice in the local papers because the ceremony was communicated to the bride and groom by sign language. [ii] Nathan was a teacher at the unfortunately named Institution for the Dumb in New York City and later at the Institution for Deaf Mutes at Jacksonville, Illinois. [iii] Nathan died in Brooklyn. “His remains were taken to Comac for interment, of which place he was a native.” Today we would not call this area Comac, as Commack used to be spelled, but place names on Long Island can be ill-defined. For more about place names, see the entry “By Any Other Name,” posted on this blog in April 2011 (https://huntingtonhistory.com/2011/04/12/by-any-other-name/). Nathan and Lavina were the parents of Charles Mortimer Totten (1831-1918) and Orlando S. Totten (1836-1902), who were living together in Brooklyn in 1865 with their mother Lavina. The brothers were both listed as milkmen. By 1900 Charles was living in Babylon. The second son of the Nathan listed on the 1790 census was Peter. He moved with his young family to Brooklyn in 1840. His son Gilson was born in 1837. Gilson’s obituary identifies his mother as Julia Ackerley Totten. Peter D. Totten is buried here with his wife Sarah W. Totten. It seems Peter must have remarried. On the 1855 New York State census, the 53 year old Peter is listed as a widow and living with Clark Ackely, presumably his brother-in-law (the spelling of name son census records is not always accurate). The 1855 census indicates that Peter and Gilson shared the same occupation but it is difficult to make out the handwriting to see what it was. 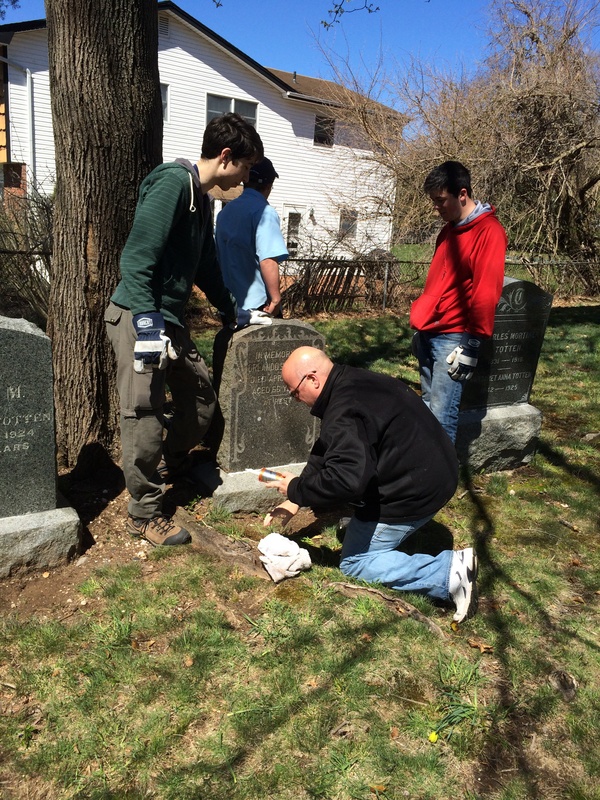 Now thanks to an Eagle Scout project by Derek Capri, the final resting place of the Totten family has been cleaned up, stones reset, and the family’s story (in part at least) revealed. [iv] Brooklyn Daily Eagle, March 6, 1916. My family lived in the house bordering the cemetery from 1964 until last year. When my parents went to purchase a house in the new development that was being built on a huge potato farm in Elwood, they were shown a map of plots to choose from. My father chose the plot at 9 Markwood lane. It had a cemetery adjoining the backyard, which some might have considered scary, but it also had the only trees for as far as the eye could see. The prospect of trees and no backyard neighbor to contend with appealed to my father so he chose that plot. In 1964, there was an old farmhouse near the cemetery. That soon caught fire – and we always wondered if it was not an accident since then the builder would be able to build more development houses. We had been told that the cemetery was placed on the highest part of the land to prevent graves from washing out. When we were first there all the tombstones were intact – 11 of them if I remember correctly.We spent a lot of time in that graveyard wondering who the Tottens were. At Huntington High school my son had Mr. Totten as his teacher and I remember asking him if there was any connection to the Elwood family. Over time, vandalism took its toll on the gravestones. My mother lived in that house for fifty years and it was sold a little over a year ago. I lived at 15 Markwood Lane from the time the house was built when I was 4 years old until I got married . Always wondered over the years what the surrounding homeowners thought of a cemetery right in our yards . My mom said it was no big deal and I remember it not being a big deal to my brothers and I growing up . But honestly – I would not buy a house with a cemetery in my yard ! Funny how we didn’t pay attention to the fact it was there ! My family also lived one house away from the back of the cemetery. When we bought our home the location was sold from a map and we too, were attracted to the only trees on the former farm. We, however, were never told it was a cemetery. We found out when our carpeting was being delivered and we were called to ask how close we were to the cemetery since the job number had been painted over. I remember rushing out there and being shocked to learn the beautiful trees were indeed a cometary. Over the years we had many pets, gerbils, birds, turtles, etc. which were ceremoniously put through a funeral procession to the cemetery. It was a wonderful neighborhood and my three children had the best of lives living on Markwood Lane.